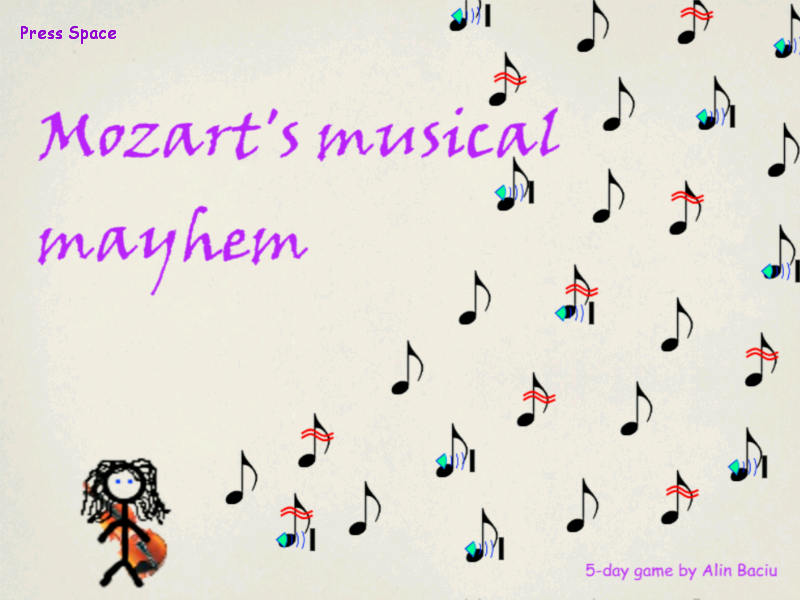 Mozart’s musical mayhem | AwkwardGames - Quote: "AwkwardGames ftw!" « The first Crayon Physics Deluxe campaign mod! Well, another month, another EGP theme. This time, the theme was “bare minimum”. In conclusion, here is my entry to this month’s friendly competition. It took a bit more to make, cause I was gone a while, but, nonetheless, it’s a 5-day game, my 3rd game in 7 days. Something terrible has happened to Mozart’s favourite violin, so he can’t play his favourite tunes anymore. Luckily, he’s got a small synthetizer, but it can only play one tone. The good thing is that it can play it faster or slower, and even add a couple of effects, like distorsion and echo. Mozart never expected that. Help Mozart make a small song using the notes his synthetizer spits out. The goal is to get your song as close to the red line as possible. The closer you are, the more points you get. You can undo your decisions, but only so many times. P.S. You can play the saved songs using min_player.exe, which you can find in the same folder with the game. The songs will be saved there too. If you have problems getting the game to run I’d suggest installing the newest DirectX 9.0c drivers and making sure you have Visual C 2005 SP1 redistributable package installed. Music: well, the music is basically just a tone generated with Audacity. The game uses Irrklang . It also uses Chorus Game Engine (my home-grown, DirectX based engine). This entry was posted on August 20, 2009 at 18:34 and is filed under 7-day games, aw-games, awkward with tags 2D, Alin, Baciu, Chorus, experimental, gameplay, Irrklang, mayhem, mozart, mozart's, musical, player, prototype, user, windows. You can follow any responses to this entry through the RSS 2.0 feed. You can leave a response, or trackback from your own site. Mozart!!!! 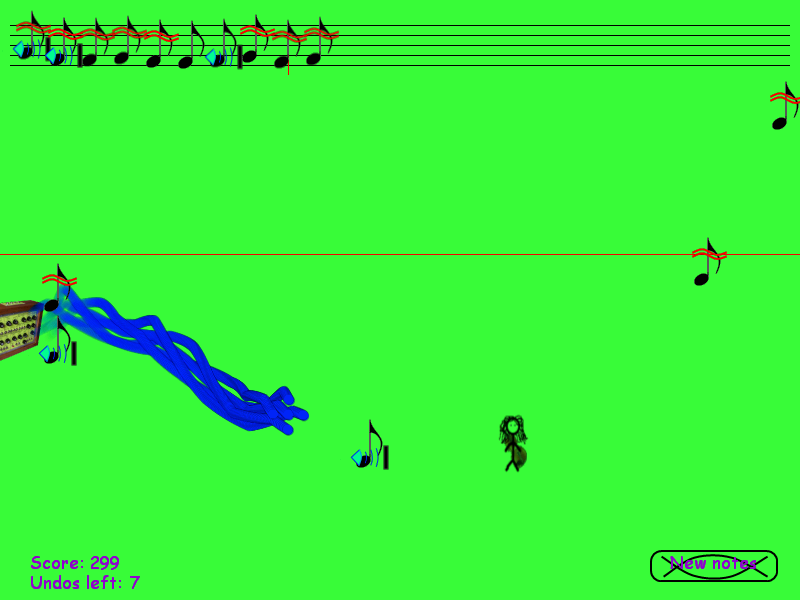 Stop swimming in mah notes, and go compose :P. Lovely little game you have here. Nice concept and nice cross between a bare minimum music composer and a “old-school famous composer that swims game”. Anywho, nice. Congrats for the game. Another cool one. Haha, well it is fun to have mozart head dive into the music, but it does get tedious pretty quickly. Nice work on this- of course it took a lot of effort and the tone generation is really cool. It might be frustrating for some who don’t understand how to get the music to go to the red line. I could get nice high scores sometimes, but maybe I would have had more fun if I knew more about synthesizers and what the symbols meant. 🙂 Looks like everyone’s taking the challenge to build games in less than a week, and it seems like you guys make a preety good job to! jack, input for a sustain pedal and an input for a power supply.